I keep being reminded to be grateful for what and who I have in my life. After an intense two weeks of dealing with and hearing about so many different problems people are experiencing in their lives, it would have been too easy to become caught up in a negative spiral of how terrible the world is and how things are getting so bad. But I didn’t and I haven’t. And here’s why. I have a naturally realistic-leaning-towards-cynical personality (ask my dad, it irritates the overly optimistic personality he holds). When faced with a problem or question I immediately think of worst case scenarios and work my way from there, therefore always feeling prepared for the worst. This can be useful but I find it disruptive to my thinking because it then becomes hard to imagine all possibilities, especially the positive ones. When I start at worst case scenario, I’m already caught up in “no, that’s not possible” or “the likelihood of that good thing happening is so low” when in reality I actually have no idea. Unless my instinct or gut is telling me otherwise, I cannot see the future. I’m learning to be a more positive person. And not positive in the sense that there is no such thing as suffering or pain but positive in terms of my outlook. And it is a learned practice. It does not come naturally. I’m learning to be a realist-leaning-towards-positive-outlook personality because I can then place myself in a mindset that will allow me to see opportunities when all seems grim. When we are caught up in a negative outlook, we miss all the possibilities of good change or chances because we have blinkers on, making us only see what our perception is telling us and that’s all the bad. Think about it, right? When I was looking for a new car to buy, I never thought of getting a Ford, never even noticed those cars on the road. Then I bought one, and all of a sudden I saw one similar to mine at every turn. Why? Because my mind had opened up to that type of car entering my reality. It’s the same nowadays on google. When I google something, related articles all of a sudden constantly appear in my news feed. If I am constantly googling negative things, I will only start viewing and reading negative things and this will become my reality. This also means I could miss all un-related articles that are better for me. I could be missing out so much more because I’ve narrowed my view to this extent. When you have a positive outlook you become more open-minded, believing in all kinds of possibilities; not cutting yourself short. Not making yourself become scared or paranoid or caught up in the idea that everything is just crap which also means in all likelihood being more emotionally caught up in the negative. Because if that’s your view, then yes, in your reality, everything will be crap. 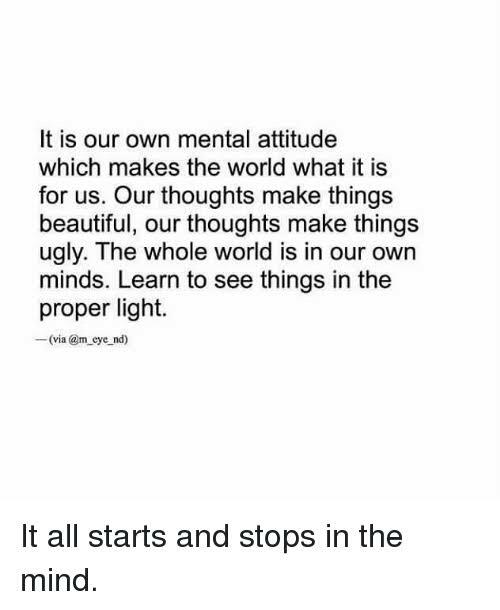 And to change your attitude takes small steps. It means lifting your head and look for one thing to be grateful for every day and your reality starts changing. Everything can’t be crap if you have something or someone to be grateful for. It means listening to yourself and your own thoughts and questioning if it’s all negative. It means trying to start or end off the day with a thought of one positive thing that happened in your day. It means googling one good thing as opposed to all bad things. These are small steps. It then also means noticing the company you keep. When everyone around you is caught up in a negative spiral, not only does this shut you off to opportunities but it just isn’t even good for your soul. It’s energy draining and soul destroying. In my reality, all that negativity just makes me feel like crap, increases my anxiety and narrows my view of the real possibilities. I want to be able to make my choices and decisions based on what truly is good for me, not based on my feelings of anxiety or paranoia which is based on other people’s anxieties and paranoia, and theirs being based on other’s anxieties and paranoia…and I think you get the point of the negative spiral. And in this kind of view I also learn that I cannot control everything except my outlook. Why live in a cloud of negativity anyway? Where will that get you? The world is beautiful and full of miracles every day, so why not live that way?